We have arrived once again at that time of the week when we get to look at our forums and share some of the conversations that they have to offer. Our community forums are free to use and are great for getting help with your webOS device, or with some development projects that you might want to try out. Here are four threads from our forums that we want to share with you this week, but there are plenty more where they've come from. 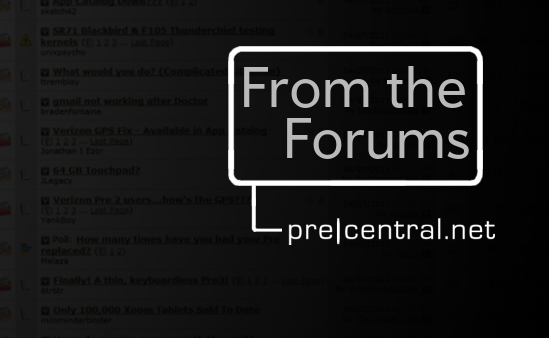 Send an email to tim@precentral.net with your favorite forum threads, and we'll be sure to add them into a future edition of From the Forums. PreCentral Forum member Clodrock has started a thread that is sure to get a lot of attention. He's asking users what they would love to see come to the patch feeds in the world of homebrew for the TouchPad. Developers shouldn't hesitate to look in on the growing wish-list; they can use this user-made list to create new apps and patches or even update their existing work to include some of these fixes. There are more than a few webOS Meetups that have sprung up in the past few days, and the webOS Events forum is where everything is going down. For example, on September 15th, the people of Indiana are planning a small event, in Portland, Oregon the word is just starting to spread that people want to get together, and in St. Louis, MO they're trying to figure out the next time they'll be able to get together. Of course, we can't forget the new webOS Meetups app, either, which you can get for free from the catalog. Zinio is an electronic magazine publisher with more than a few years of experience in building a good brand for people to get hooked on, so it's no strange event to see webOS users wanting to get their hands on a version of the app that works with the TouchPad. In our forums, a thread was started to discuss exactly this topic, and in return the CMO of Zinio, Jeanniey Mullen, has replied to say that a TouchPad app is on the way. Keep your eyes on that thread and right here on this blog - we'll let you know as soon as it arrives. Homebrew App Developer PCWorld has his work cut out for him over the next several weeks. Some users in our forums are searching for a way to get their hands on an FTP client that works with the TouchPad (and other devices). So, where does PCWorld come into play with all of this? He's already been working on one, and if his Pre-sized FTP client works as well on the TouchPad as it seems to work on webOS smartphones, then we'll have something else to look forward to arriving on our devices very soon.